One of the highlights of Christmas is the Doctor Who Christmas Special, and this year promises to be no different with the return of Alex Kingston as River Song. For the first time Peter Capaldi's version of the Doctor comes face to face with his wife River Song, but will River realise who he is with his new body and face? That question will be answered in the 2015 Doctor Who Christmas Special, though the reunion is a little complicated by a rather nasty cyborg. A robot bodyguard is not the image normally associated with Christmas, but this is Doctor Who and this year’s Christmas special, due to air on BBC One at 5.15pm on 25 December 2015. The robot is guarding King Hydroflax, a cyborg himself, played by Greg Davies, but the real fan interest is in the news that the hour-long episode will see the return of River Song, played by Alex Kingston. The episode, written by Steve Moffat, is set on Christmas Day on a remote human colony and the Doctor is hiding from Christmas carols and comedy antlers, that is until a crashed spaceship calls upon the Doctor for help, and he finds himself recruited into River Song’s squad and hurled into a fast and frantic chase across the galaxy. The episode is called “The Husbands of River Song” and in it King Hydroflax is furious, his robot bodyguard is out of control and coming for them all. Will Nardole survive? 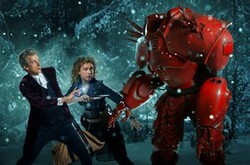 And will River Song work out who the Doctor is? This is set on a starliner full of galactic super-villains with a destination the Doctor has been avoiding for a very long time. This will be the first time River Song has seen the Doctor since he regenerated into the version played by Peter Capaldi, and Moffat admits that was a driver for the episode. Surrey-born Alex Kingston was nominated for a best actress Bafta for her role as Moll Flanders in the 1996 TV movie The Fortunes and Misfortunes of Moll Flanders. She first appeared on TV screens though back in 1980 as Jill Harcourt in Grange Hill, and in the same year she was a schoolgirl in The Wildcats of St Trinians. Other notable recurring roles have included Caroline Carrison in Crocodile Shoes, Katherine Roberts in The Knock, Mrs Benner in Lost in Austen, Dr Elizabeth Crowley in ER, Ellie Lagden in Hope Springs, Helen Maynard in Marchlands, Dr Blanche Mottershead in Upstairs Downstairs, Ruth Hattersley in Chasing Shadows and Dinah Lance in Arrow. She made her first Doctor Who appearance in 2008 in “Silence in the Library” and “Forest of the Dead” and this will be her 17th appearance. A BBC Cymru production, the episode was written by Steven Moffat, directed by Douglas Mackinnon, executive produced by Brian Minchin and produced by Nikki Wilson. As well as Peter Capaldi as the Doctor and Alex Kingston as River Song, it stars Greg Davies as King Hydroflax, Matt Lucas as Nardole, Rowan Polonski as Flemming, Nonso Anozie as Tharg, Tom Chadbon as Lord Chamberlain, Aidan Cook as the robot and Phillip Rhys as Ramone. It also features Robert Curtis and Chris Lew Kim Hoi. And it was meeting Matt Lucas’ character that was Capaldi’s favourite moment.